The Society for Nordic Roleplaying (that we recently founded) publishes two roleplaying games in Finnish this summer. Ikuisuuden laakso and Itran kaupunki open up new topics for roleplaying. 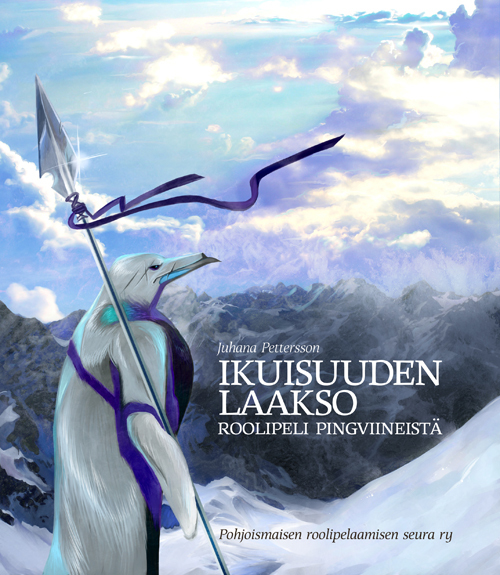 The philosophical Ikuisuuden laakso (“Valley of Eternity”) is Juhana Pettersson’s first roleplaying game. It is a tragic RPG set in the Antarctic, in which the players take on the roles of hero penguins living on the borders of penguin society. The life of a hero is not an easy one, even if they are penguins: she must sacrifice everything in her battle against skua gulls and leopard seals, but will always remain a stranger in the eyes of her fellows. The anthropomorphic animals are a cleansing, distancing element in Ikuisuuden laakso, but obviously they also provide comedy. Juhana Pettersson is a Helsinki-based game designer and journalist. As the editor-in-chief of Roolipelaaja magazine he is a pioneer of RPG journalism. He has also written the much lauded non-fiction book Roolipelimanifesti (“Role playing manifesto”) in 2005. Pettersson has studied media art in France. “The penguin is the everyman of Ikuisuuden laakso. A penguin is noble and foolish at the same time, and can thus avoid the ubermensch ideas which traditionally arise when dealing with the topic of heroes and heroism,” Pettersson says. Itran kaupunki (“The City of Itra”) was originally published in Norwegian as Itras by, and is the first roleplaying game translated into Finnish from a language other than English. 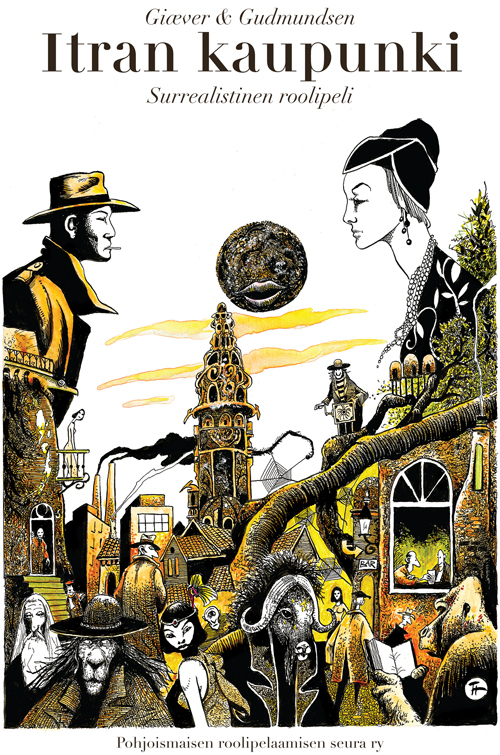 The game is set in a surrealistic 1920s city that is controlled from the mysterious Moon Tower, and whose streets are filled with the strangest of figures. Itran kaupunki draws from the tradition of roleplaying games, surrealism, futurism, and Norwegian children’s literature. The creators of Itran kaupunki are Ole Peder Giæver and Martin Bull Gudmundsen. Giæver has roleplayed since he was ten. He works as a journalist in the Norwegian online paper ABC Nyheter. Gudmundsen studies psychology at the Oslo University. The Society for Nordic Roleplaying works to facilitate the development and growth of Nordic roleplaying culture in Finland by making works published in other Nordic languages available in Finnish. We also work to keep the local scene vital by publishing groundbreaking new games by Finnish designers. The Nordic countries of Finland, Sweden, Norway and Denmark are at the vanguard of global roleplaying culture. Nordic games have broadened the horizons of what can be done in the roleplaying medium and broken barriers between roleplaying and other artforms such as performance art and theatre. So far, English has been the language of Nordic cooperation. Ideas have been exchanged at international forums like the annual Knutepunkt event, but actual roleplaying publishing has remained a national affair. Games published in Norwegian or Danish won’t reach audiences in other countries because of the language barrier. Both games will be published at Ropecon on July 31st, 2009. Ropecon is held annually in Espoo.